by Admin.In Accessories, Current Detectors, Flow, Gas Detectors, Humidity, HVAC, Power, Pressure Transmitters, Principals, Temperature. CMD Series: Precision gas control/sensing. Peace of mind through reliable gas monitoring. The CO Detector sense and transmit to any compatible electronic analog control, DDC/PLC controller or automation system for the control of ventilation equipment. The CO Detector features electrochemical sensing elements with a menu driven setup/calibration. It is powered by either AC or DC source with no change to circuit required. A choice of three field adjustable analog output signals, linearized over full range is available. Optional LCD for displaying PPM level and menu options. Field replaceable calibrated sensor module. 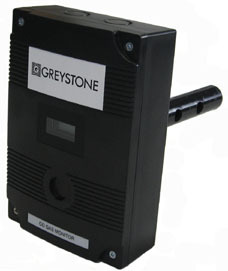 Environmental, industrial and commercial indoor Carbon Monoxide (CO ) gas detector. Available in both a space and duct mount version. To sense and transmit carbon monoxide levels to any compatible electronic analog control, DDC/PLC controller or automation system for the control of ventilation equipment. Typical usage in underground Car Parks.